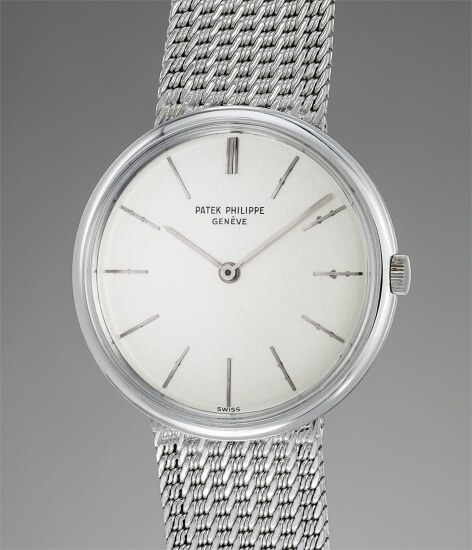 Accessories: Accompanied by Patek Philippe Extract from the Archives confirming production of the present watch with platinum bracelet in 1958 and its subsequent sale on October 5, 1959. Further accompanied by Patek Philippe presentation box. Manufacture of reference 2591 started in 1957 and epitomizes perfectly the design acumen of the era with its perfectly balanced minimalistic dial devoid of any unnecessary clutter. The fireworks however are reserved for the bewildering original platinum mesh bracelet (as confirmed by the Patek Philippe Extract) giving the watch an inimitable panache. Reference 2591 was made mainly in yellow and white gold and only 5 models in platinum are known. Fresh to the market, the present watch is the only known example with original removable platinum bracelet and most probably a unique piece. Finding this a unique piece in such attractive condition is a true opportunity that should not be missed.